Description: Bushy shrub to 35 cm high; branchlets minutely scabrous. Leaves oblong, 4.5–7.8 mm long, 1.2–2.3 mm wide; margins entire and finely toothed near apex; lamina glabrous, discolorous, upper surface flat or slightly convex, lower surface often glaucous and with 3 central ± parallel veins; petiole 0.5–1.3 mm long. Flowers erect, generally unisexual, 3–8 flowers plus rudiment in spikes up to 7 mm long, white; bracteoles 1–1.6 mm long. 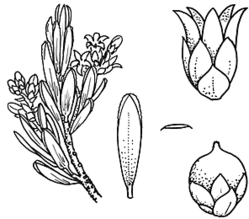 Sepals 1.5–1.9 mm long. Corolla tube 1.2–1.85 mm long, glabrous; lobes 1.25–1.6 mm long. Fruit depressed-globose, 1.8–3.4 mm long, smooth, glabrous, red. Distribution and occurrence: Grows in heath, grassland and on rocky slopes above 1800 m alt. ; common, from Mt Stillwell and Mt Kosciusko areas.